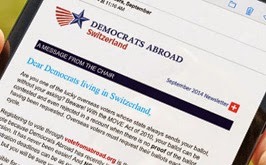 As your newly elected Executive Committee (ExCom) of Democrats Abroad Switzerland (DACH), we are excited to get started on the important work ahead. The purpose of this email is to introduce ourselves, inform you of DACH events in May and highlight our online member survey. DACH has several interesting events and activities planned for the month of May. Next to each is a link to the complete details of the event including all logistical details. Penny (or a T-shirt in this case) for your thoughts! We look forward to seeing you at one of the many events planned in May and hearing from you via the survey!